The journey’s goal – visiting Galza exhibition. International association of ASCII artists, representatives of CyberDecadence within the project’s framework an archaic branch of the digital art – text mode art – is represented. Izhevsk is a city of fabrics. It has about 800,000 citizens and about 30 of biggest Russian fabrics and factories. The first things we saw in this tough city were sun and black of smog snowdrifts. 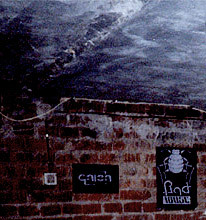 An underground room with naked armature, an industrial-punk styled gallery. Gloom, video projections of ASCII images on the flatness, IDM music. The expositional hall was immersed in the soft light that made you feel like soaring and the works seem weightless. The code symbols were of an unnatural whiteness, hiding the handmade background in the darkness of space. The light sharpened the nuances, giving the compositions extra volume and revealing gradations of technique. The mass media was really interested in the underground art of the pioneers – the people who learned the birth of civilization and made their way from primitive PC models to those now existing. This project’s members study and create the primary computer forms that are being lost in the rapid current of evolution. Their monthly releases are to find are at http://galza.org.